The GM LTA was followed by the type SRB8 (above), and after this model, Marzotto designed the type SRAF 97. The SRB8 engines are intended for normal vertical mounting into the frame, whilst the type AF97 is especially designed for horizontal mounting. The differences between the older SRB8 and the new AF97 are mainly in the head. In the type B8, the inlet ports and track are twin ports and on these, there is a manifold for mounting the carb. Similarly, the exhaust ports are also twin ports with a manifold for mounting the exhaust pipe. On the AF97 however, there is for both the inlet and exhaust ports only one big round hole. The B8 also has two short chain guides as opposed to the AF97 which has an extra long camchain guide in combination with a short guide. The electronic ignition in the B8 engine is supported by only one bearing, whereas, in the new AF 97 engine, the ignition is now supported by an extra bearing mounted in the ignition cover. 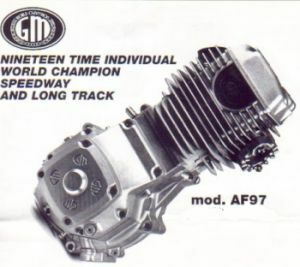 For both the B8 engine and the newer AF97, there are 3 types of cams available, 2 for grass and longtrack racing, and 1 for speedway racing. The speedway cam lifts 9.52 mm, the other 2 types 11 mm. The inlet valves for both types are 34 mm and with 6 or 7 mm shafts. The exhaust valves are 30 mm and also with 6 or 7 mm shafts. For the valve seats you can choose between bronze or steel. Valve angle is 34 degrees, and this give a very compact combustion chamber. On each valve there are 2 valve springs. The cylinder is Nikasil coated, therefore a rebore is not possible. The buyer of GM engine can choose between a normal piston or slipper piston. The conrods come in 2 types as well, and are made of steel. Again there is standard conrod, and a type that is a little longer for changing the compression. Roller bearings are used in the bigend and are with either normal steel cages or with silver cages. The ignition system is made by Selettra. Oil compartment is 800 cc.